Whether you're after chubb on a hot summer day‚ pike fishing on a frosty morning‚ after perch or zander. Bass fishing in the Channel Islands‚ on holiday in the Med or big game fishing in Cuba. 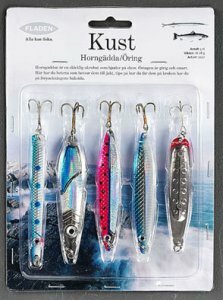 We have a full range of lures to suit any occasion‚ for the specialist and the novice - surface lures‚ poppers‚ shallow divers‚ deep divers‚ plugs and trolling lures‚ pike lures they're all here just take a look.